November 11, 1918 is the symbolic date of Poland regaining its independence after the partitions and occupation which lasted over a century. The date is symbolic because the process of recapturing independence was a gradual one, peaking during the last two years of WW I.
Dr. Teofil Lachowicz, an esteemed historian of the Polish Home Army in America, makes the point that when talking about Polish independence, it is imperative to stress the great effort of the Polish diaspora in America during World War I. Some 20,000 members of that diaspora joined the Polish Army contingent in France, the so-called “Blue Army”, lead by General Józef Haller. No other diaspora worldwide can claim such a heroic sacrifice. It was the decree of the French president from June 4, 1917 that gave rise to the volunteer-based military contingent – the Polish Army. It consisted of volunteers who served in the French army as well as of the Polish prisoners of war from the German and Austrian army (in the amount of some 35,000.) Its integral part, however, was also the volunteers from the United States (some 20,000) Canada (221 persons) and Brazil (over 300). The army was lead by General Józef Haller. The Blue Army was considered by the countries of the Entente as the only Polish, independent army unit fighting side by side with the allies. It was equipped with modern arms, including Renault FT-17 tanks, and significantly helped in the future effort of forming a Polish Military. The factual formation of the Blue Army did not start until the beginning of 1918, when Polish volunteers from the United States arrived. Activists of Sokół took the lead. The cost of training. Equipment and transportation of the army unit was covered by the French government and the recruitment in America was happening under the leadership of the Polish Gymnastic Society Sokół (Polish Falcons Gymnastic Society.) The society had already been essential to the development of Polish identity, awareness and enhancement of physical endurance among Polish youth. On January 22, 1917, the United states voiced their position regarding Poland. That was largely thanks to the many diplomatic efforts by Polish organizations and personal friendship shared between Ignacy Jan Paderewski and president Woodrow Wilson. Wilson’s address was not only a reflection of the popularity of the idea of national states. It had also the strategic significance of assuring the vote of Polish Americans in light of the upcoming election. Wilson’s position had that much more significance because in 1917 the United States decided to enter the war siding with the countries of the Entente (the alliance between France, Russia and Great Britain, formed in 1892-1907). On October 5, 1917, Wilson signed the decree which opened door to Poles living in the United States to form their own army. Since the American law disallowed for training of foreign forces on its territory, Canada aided the cause by making a piece of land available for this purpose. It was the area near the town of Niagara-on-the-Lake. The camp acquired the patronage name of Tadeusz Kościuszko. 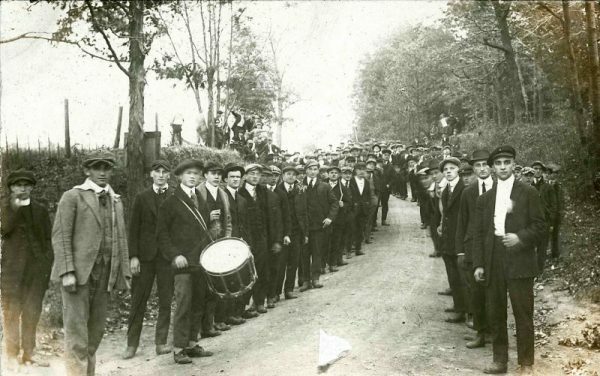 Most of the volunteers arrived to the camp through the American city of Buffalo, N.Y. There, since June 9, 1917, the Polish American Citizens Committee coordinated the joint effort of numerous Polonia organizations to assure that the volunteers in the camp had sufficient food supplies, transportation and living space. It was led by Fr. Cezary Krzyżan and Fr. Franciszek E. Fronczak who was also the health commissioner for the city of Buffalo and a member of the Paris-based National Polish Committee. Even though the United States entered the war in April of 1917, on March 19 (disregarding the position of the then-neutral United States) the Polish Officers’ academy opened in Cambridge Springs, PA. In the next seven months, some 400 cadets finished courses offered there. Just in the first three months of the United States’ involvement in the war effort, some 40 thousand volunteers applied with the American Army. At that time, per sources, some three million Poles lived in the United States. The Department of War, in Washington D.C., set the legal framework concerning recruitment of Polish volunteers. It turned out that the Polish army could not be joined by Poles who were between 20 and 30 years old, who had the second citizenship, that of the United States. Another regulation made the volunteers ineligible for benefits (hospital care, pension, etc.) which were at the disposal of the American Army veterans. The French vessel “Niagara” took the first group of people to France from New York. The destination of the December 1917 journey was the city of Bordeaux. The recruitment effort, which lasted sixteen months, ended in February of 1919 by the order of General Haller, and resulted in the enlistment of over 20 thousand soldiers. In Detroit, the recruitment effort was supervised by the Central Citizens Committee. Some two thousand soldiers were sent. It would be a separate topic worthy of pursuit to give full account of the effort which the Central Citizens Committee played in the system of social engagement. Today, however, I will simply mention that since 1917 the Committee was a part of the Polish National Department and the representative of Detroit Polonia. It enjoyed great respect and moral authority, and was highly regarded by all societies and associations. It was the center of life of Polonia organizations. Its leadership consisted of the finest politicians: Leopold Kościński, assistant to the County Prosecutor; Jan Lesiński, future congressman; Jan Bare, future state marshal of Michigan, and Jan Okroy; Benjamin Stańczyk, judge, and others who made their mark on the pages of Polish-American history. Returning to the original theme. Since Poland did not have a single manufacturer of arms, there was a shortage and no funds for purchases. Piłsudski had great hopes for a change of that situation and hoped for an influx of equipment coming with the Blue Army. The first train carrying Polish units to Poland crossed the border overnight, on 19/20 of April, 1919. General Haller arrived in Warsaw on April 21 and received a welcome worthy of a national hero. The magistrate bestowed on him the title of Honorary Citizen of the City of Warsaw. After the trip to Poland the Army took part in the victorious Polish-Ukrainian battles in eastern Galicja and Wołyń. General Haller also managed the defense of Silesia, while Wojciechowski, in Puck, committed Poland to the Baltic Sea in a symbolic gesture. During the Warsaw Battle he commanded the units defending the front terrain of the capital, and was a member of the National Defense Council; later he lead the North-Eastern Front. The Blue Army was the best-equipped Polish unit during the Polish-Bolshevik war. It had tanks, aircraft, engineering contingents, instructional and cavalry units as well as artillery, field hospitals, a full array of supplies donated by the French and matching uniforms (the blue French uniforms.) It brought to Poland enough arms and war equipment to successfully supply a million-member army. Equipment, deep patriotism and high morale exhibited by the volunteers were exactly what the newly independent Poland needed and counted on. The untold portion in Polish history has to do with the fact that after the Blue Army arrived from the west, in 1919, Piłsudski began to systematically replace its officer segment with his own members of the former legions. This move was particularly targeting the middle and lower ranked staff. He also dismantled the American contingent at a time when the struggle for stable borders was still not over. Śląsk and Eastern Prussia continued to be under the brutal German occupation, and in the East the battles continued with the Ukrainian insurgents. The Czechs had taken possession of the Cieszyn Śląsk. Piłsudski’s decision to cancel the volunteers from the United States was met with great disappointment and outrage by American Polonia. The mandatory and very quick demobilization conducted partially in 1919 and capitalized right after the end of the Bolshevik war, as well as the manner in which the Polish Republic handled the veterans’ affairs and its obligations to them, were a very bitter experience to them. Some 12.5 thousand former volunteers returned on American ships to New York. The post war reality and economic situation were, to them, nearly tragic. After nearly a quarter century, history made a turn again and in March of 1941, the Polish recruitment mission arrived on the welcoming soil of Canada from the United States. American Polonia remembered and learned from the experiences of the past. The list of volunteers this time did not reach a thousand names.